You must have heard about pyramids in Egypt. How did ancient people measure the height of pyramids without actually climbing them? They used the concept of ‘similarity’ of polygons to measure the heights and distances which are otherwise difficult to find. Don’t you notice that they are identical except for their sizes? figure on its right side. When you measure the length of the sides of these figures, You will notice that they are in the same ratio. You will also notice that the angles at each of the corresponding vertices are same. Notice that regular polygons of same number of sides are always similar. Let us observe the following figures; Don’t they appear of same shape? 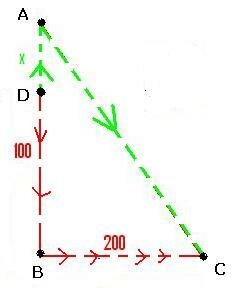 The ABC and DEF are similar triangles and we represent this by ABC ||| DEF . Figures have same shape and same size. Similar triangles need not be congruent. In 6.3.3 we have observed that it is not possible to construct unique triangle given three angles. To Prove: AX/BX = AY/CY. 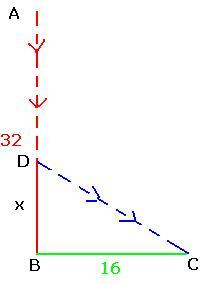 Conversely, If a straight line divides the two sides of a triangle proportionately then that line has to be parallel to the third side. (Note: Proof is not provided for this (The proof is by logical reasoning). 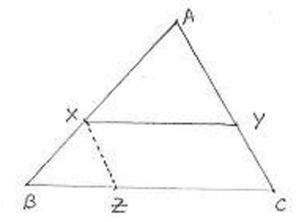 find the relationship between perimeters of these two triangles. which is one and half times the perimeter of ABC. India around 400AD. It is amazing to note that it has not rusted till today. This pillar is quite tall. Let us use properties of similarity to find its height. 2 feet 8 inches. If your height is 5’4”. Find the height of the pillar. For simplicity let us convert all measures to inches. Let the pillar be represented by AB. You are at D, 110 inches (9’2”) away from the pillar. Your height is represented by DP = 64” (5’4”). Shadow cast by pillar (DC) is 32 inches. ACB is a common angle to both BAC and PDC. The height of iron pillar = 284 inches = 23 feet 8inches. You will notice from history books that this answer is correct. ABC = DEA = 900. Since A is the common vertex of triangles ABC and DAE, BAC = DAE. 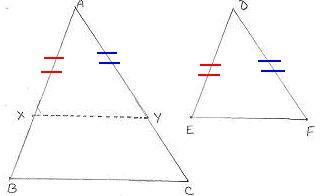 Since two angles of these triangles are same, third angle also has to be same ( BCA= ADE). 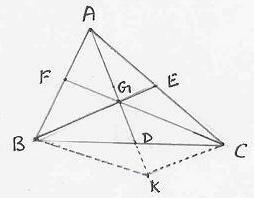 Therefore ABC and DEA are equiangular (similar) triangles. Therefore by theorem, corresponding sides are proportional. 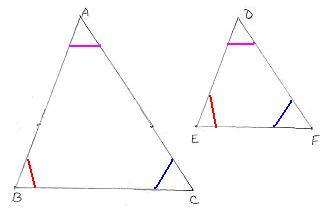 The triangles BCO and DOA are equiangular. 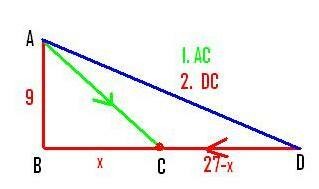 Data: Let ABC and DEF be similar triangles, in which (BC,EF), (AB,DE) and (AC,DF) are pairs of corresponding sides. Hence by SSS Postulate they are congruent. In the above theorem, in step 7, we had proved that triangles ALB and DME are equiangular. 6.13.1 Problem 8: In ABC, BE is Perpendicular to AC and CF is perpendicular to AB. BE and CF intersect at O. 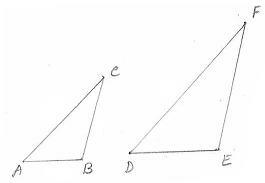 Construction: Draw Perpendicular to base BC from A and D to cut the line BC at E and F.
6.13.1 Problem 10: Prove that internal bisector of an angle of a triangle divides the opposite side in the ratio of the sides containing the angle. in the ratio of the sides containing the angle, then the line segment bisects the angle. 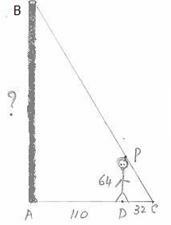 6.13.1 Problem 12: What is the height of the intersecting point joined by strings tied to the base and top of poles of height 15 and 10 ‘Mola’s( A unit of measurement)? ( Lilavati Shloka 162) . ( Lilavati Shloka 244). Bhaskara also gives formulae to solve these types of problems. AB is the Deepa, CL and EM are the initial and final positions of the toy whose height is 12”. CD is the shadow of the toy at C and the length of the shadow is 8”. EF is the shadow of the toy at E its length is 12”. In a right angled triangle, the square of hypotenuse is equal to sum of squares of other 2 sides. There are around 50 proofs for this theorem and we use one of the simplest proof here. 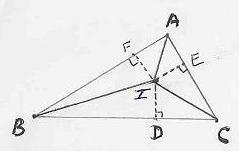 Note : It was Baudhayana (600BC), an Indian mathematician who first found this relationship in a right angled triangle ! Proof is provided by constructing another right angled triangle and then proving that both are congruent (By using SSS postulate). 6.13.2 Problem 1: A school has a compound wall of 400 feet. A painter was asked to paint the wall. The painter charges Rs 80 per sq. ft to paint the wall. school pays the painter to paint the compound wall. If we find the area of the compound wall, we can multiply this area by the rate, to know howmuch the painter is to be paid for his work. Area of the compound wall = 400*8 = 3200 sq ft. Since the painter charges Rs 80 per sqft. Total amount payable is Rs 2,56,000 (=3200*80). From your house you cycled 8 km to the north and then 5 km to east and then 4 km to the north. How many km did you peddle to reach the other school? Draw a figure to represent AB= 8km, BC=5km and CD=4 km. The route you cycled is ABCD. We are required to find DA. Draw a line DE parallel to CB to meet the extended line AB at E.
The pole breaks at 12feet from the bottom. 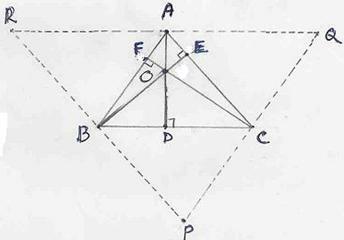 This is as per Pythagoras theorem. of tree BD. Distance travelled. BD represents the tree of height 100 Mola(say Feet). C is the pond 200 Mola(Feet) away. AB is the pillar of 9 feet. Peacock is sitting at A. D is the position of snake at a distance of 27 feet from the pillar. Peacock follows the path (AC) of a triangle to catch the snake. Let C be the place where peacock catches the snake. Let BC=x. tied between the top of central pole and top of the other poles around it. Find the length of the rope required to tie the poles at the top. The erection of poles can be represented as in the adjoining figure. AC is one of the supporting poles of height 6 meters, put up on the ground, around the central pole. We are required to find DC. From C, draw a line parallel to AB to cut BD at E.
Therefore the length of the rope required to tie these 2 poles at the top = 13 meters. 6.13.1 Theorem 3: Areas of triangles having a common vertex and having bases along the same line, are proportional to the lengths of their bases. 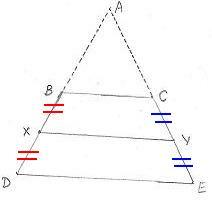 In the adjoining figure triangles ABP, ABC and ABD have the same vertex A and their bases are on the same line BD. 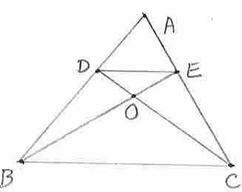 all the triangles are same. We know that Area of a triangle = ½*Base*Height. they are also similar to the given triangle. hypotenuse and the side opposite to 600 is /2 times the hypotenuse. Construction: Produce BD such that DC = BD. Join AC. In addition to AAA postulate on similarity discussed in the beginning of this section, we have three more postulates on similarity. This statement is called ‘SAS (Side, Angle, Side) Postulate on Similarity’. 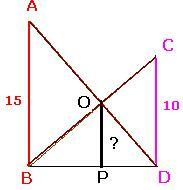 In the adjoining figure AB/DE = BC/EF and their included angle ABC = DEF. There fore ABC ||| DEF. 3. 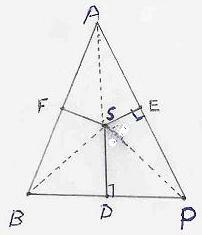 ‘Two triangles are similar if the sides of one triangle are proportional to the corresponding sides of another triangle’. This statement is called ‘SSS (Side, Side, Side) Postulate on Similarity’. Given: Transversal p makes intercepts on three lines, l, m and n.
6.13.3 Problem 1: In the adjacent figure the medians IB and JC meet at G. Prove that BG = 2GI. Since BI and CJ are medians, by definition of a median BJ=JA and CI=IA. Hence J and I are mid points of the sides of the triangle. 1. DOE and EOC have bases on the same line (DC) and same vertex E. Hence their areas are proportional to their bases (=DO/OC). 2. DBE and DBO have bases on the same line (BE) and same vertex D. Hence their areas are proportional to their bases (=BE/BO). 3. 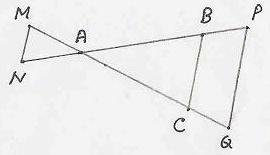 ABC and ADE are similar triangles and hence their areas are proportional to the squares of their corresponding sides (=BC2/DE2). Follow above steps to prove this. 6.13.2 Problem 8: Find the area of an equilateral triangle whose equal sides are ‘a’ . arrived in the above problem (6.13.2 Problem 7). 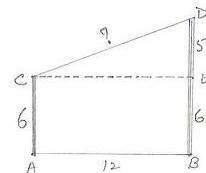 Hint: Apply Pythagoras theorem to three triangles (AEB, AED, AEC). Then substitute and simplify the terms and also use the given data that BD=DC. In section 6.4 we studied many concepts such as Incenter, Circumcenter, Orthocenter and Centroid. We shall prove their special properties here. 6.13.4 Theorem 1: Prove that angular bisectors of a triangle are concurrent. Given: In ABC, the bisectors of ABC and BCA meet at I. IA is joined. To prove: AI bisects BAC. Thus angular bisectors are concurrent at I (Incenter). 6.13.4 Theorem 2: Prove that perpendicular bisectors of a triangle are concurrent. 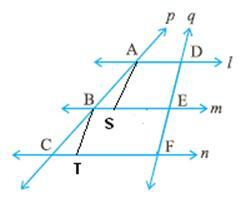 Given: In ABP, perpendicular bisectors SD of BP and SE of AP meet at S and SF is Perpendicular to AB. To prove: SF is perpendicular bisector of AB. Construction: Join SA, SB and SP. Thus perpendicular bisectors are concurrent at S (Circumcenter). 6.13.4 Theorem 3: Prove that altitudes of a triangle are concurrent. Given: In ABC, altitudes AD from vertex A and BE from vertex B meet at O. CO is produced to meet AB at F.
To prove: CF is perpendicular to AB. 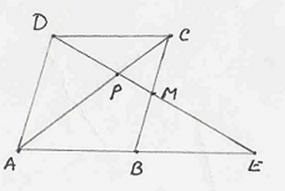 Construction: Through A, B and C draw parallel lines to the bases BC, CA and AB respectively forming PQR. Thus Altitudes are concurrent at O (Orthocenter). 6.13.4 Theorem 4: Prove that medians of a triangle are concurrent and their division is in the ratio of 2:1. Given: In ABC, the medians BE and CF meet at G. AG produced to meet BC at D.
Construction: Produce AD to K such that AG=GK. Join BK and CK. Similarly we can prove that 2GE=BG and 2GF=GC. 6.13.5 Relationship between similarity and size-transformation. when the actual constructions to be built are very small. Let us study the adjacent figure. 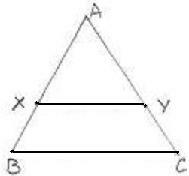 ABC is a triangle and P is an external point. 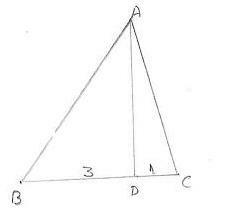 By joining A1, B1, C1 and A2, B2, C2 we get A1B1C1 and A2B2C2 as two other triangles. The type of enlargement or reduction discussed above is called ‘Size Transformation’. 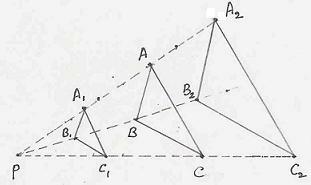 Size transformation is not restricted to triangles and they are applicable for all types of geometrical figures. 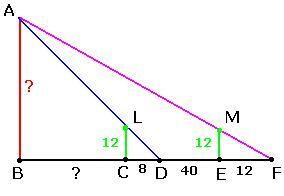 If the scaling factor is k then each side of the resulting figure (image) is k times the corresponding side of the given (original) figure.